Traffic congestion refers to the incremental delay and vehicle operating costs that result from interactions among vehicles, particularly as traffic volumes approach road capacity. Conventional transportation planning tends to consider traffic congestio n a significant cost and congestion reduction is often a dominant planning objective. How congestion is evaluated can significantly affect planning decisions. For example, transport system performance is often evaluated primarily on the basis of congestion indicators such as roadway Level of Service (LOS). This assumes that 1) transportation means driving; 2) vehicle traffic speed is the main evaluation criteria; 3) congestion reduction is the primary planning objective; and 4) roadway widening is the best solution. It tends to ignore other modes, other impacts, other planning objectives, and other types of transport system improvements. This approach can have unintended consequences. Consider how this can affect planning decisions. Residents of compact, multi-modal urban neighbourhoods tend to drive significantly (typically 20-60%) less than residents of automobile-oriented suburban neighbourhoods which reduces regional traffic congestion, accidents and pollution emissions. However, more compact, urban infill development is often opposed on the ground that it increases local traffic congestion as measured by roadway LOS on nearby roads. In this way, focusing on local traffic congestion can result in planning decisions that increase total & regional congestion and other transport problems. Similarly, if congestion is considered a problem at a school or other activity centre, a common response is to expand local roadways which is considered a roadway improvement, although wider roads and higher vehicle traffic speeds create a barrier to walking. 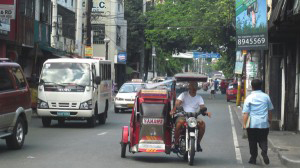 This can create a self-reinforcing cycle of less walking, more driving, more traffic congestion and wider roads. 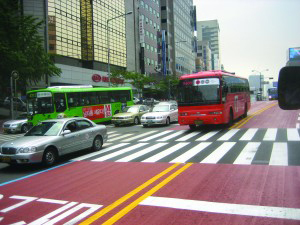 These examples illustrate how congestion evaluation practices can affect planning decisions. Different assumptions and evaluation methods can result in very different conclusions about the magnitude of congestion costs and the effectiveness of specific congestion reduction strategies. To the degree that congestion costs and roadway expansion benefits are exaggerated, and alternative transport system improvement undervalued, the transport planning process will fail to implement the most cost-effective options. Using a comprehensive analysis to evaluate common congestion reduction strategies including roadway expansion, improvements to alternative modes, demand management strategies and smart growth land use reforms, it is important to critically examine the congestion costing methods. Omissions and biases in current congestion costing methods need to be described and guidelines need to be provided for more comprehensive and objective analysis. This is a timely issue due to changes in transport demands and planning objectives. Much of this analysis also applies to parking congestion analysis. 1. Determine the differences between peak and off-peak traffic speeds for individual roads and use the results to calculate roadway network congestion indicators such as the Travel Time Index (TTI). For example, a 1.3 TTR indicates that trips which take 20 minutes off-peak take 26 minutes during peak periods. 2. Use vehicle operating cost models to estimate the additional fuel consumption and pollution emissions caused by congestion, and use the results to monetise (measured in monetary units) congestion costs. 3. Use these estimates to predict the time and economic savings of specific congestion reduction strategies. 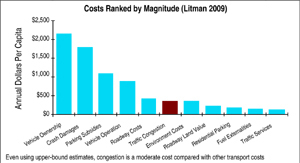 Various studies have calculated monetised congestion costs for various cities and countries (“Congestion Costs” Litman 2009). Figure 3 compares congestion with other transport costs measured annual per capita. Vehicle expenses average about $4000, crash damages more than $1500, parking facilities more than $1000, and roadway facilities about $400 per year, compared with $350 congestion costs. This indicates that congestion is a moderate cost overall, larger than some but smaller than others. This means, for example, that it would be economically inefficient to implement a strategy that reduced congestion by 20% if doing so increases total vehicle expenses, crash damages or parking costs by 5%, but a congestion reduction strategy becomes far more cost effective if it provides even modest reductions in these other costs. •	They only measure congestion intensity on particular roadways, rather than total congestion costs. They ignore the additional delay and transport costs caused by dispersed development and reduced transport options that increase per capita driving. Indicators such as the TTI imply that congestion declines if uncongested travel increases since congested travel is divided by more total vehicle-miles. •	They only consider impacts on motorists. They overlook the congestion avoided when travellers shift mode, and delays that wider roads and increased traffic impose on to pedestrians. •	They estimate delay relative to free flow conditions. Economists point out that it would be economically inefficient to build enough roadway capacity to allow free-flow driving under urban-peak conditions. •	They apply relatively high travel time cost values (typically 35-60% of average wage rates for personal travel, and more for business travel). Lower values are often found when motorists’ willingness-to-pay is actually tested with congestion tolls.